Crossing the border into Jordan was interesting. First a taxi ride from the bus to the Israeli side of the border. Then a walk to the Israeli customs and immigration offices. Then a short walk across the border to the Jordan customs and immigration offices. Here we presented our “Jordan Pass” and got free visas (as well as entry to a heap of attractions in Jordan – brilliant). Then a bus ride to a gate. Here we needed to catch a taxi a few kilometres to another checkpoint where the driver, George, from our Amman hotel was allowed to meet us. 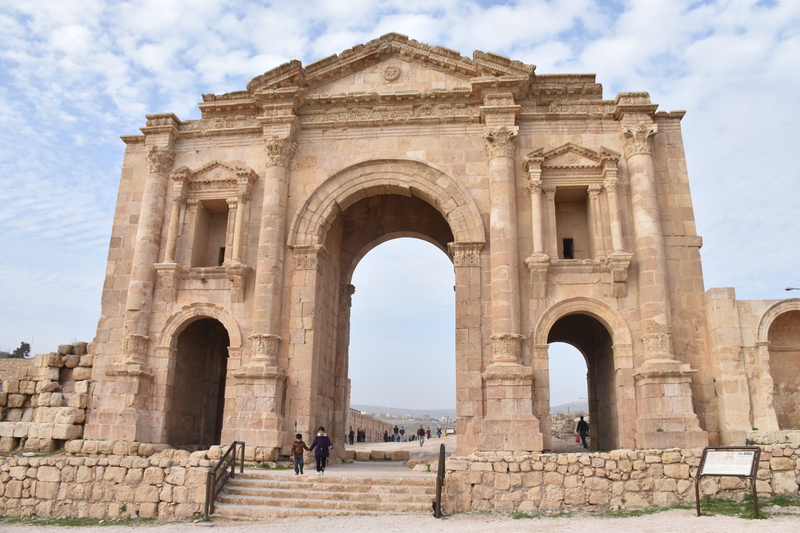 Jerash – wow. Jerash is simply breathtaking – one of the great Roman cities (with some Greek thrown in for good measure) of the empire – a regular hangout of Emperor Hadrian. Impressive gates, two theatres, the oval precinct, colonnades, grand temples, columns everywhere – all largely intact. There was also a reconstruction of a stone cutting machine, powered by water – which predates those man-made machines in China. We could have easily spent another couple of hours there but we had to leave when it started to close at 5pm. So back to George for the short drive into Amman and to our Hotel, a modest establishment owned by Raymond, a Palestinian born Australian, whose previous Hotel was in Damascus – which he had to abandon due to all the troubles in Syria. Raymond was also super nice and super interesting as were all the staff. And Raymond encouraged all the young aspiring musicians from Amman to come and play and dance at the restaurant so we got a floor show over dinner. Amman, being the capital of Jordan was mildly interesting. It has a great Amphitheatre and some interesting Roman ruins on the hill behind the city centre. The small shops in the town centre were interesting to wander through and there’s a small restaurant/bar strip where we ate great Italian sans great Italian wine. With one eye on the weather that was coming, we decided to head out with George to Madaba, then Mount Nebo, and finally down to the Dead Sea. Madame was a very early Christian town and has an extraordinary mosaic map of the holy lands in the Church of St George – originally made up of 2,000,000 pieces of tiny mosaics. Mt Nebo is where Moses died and on a good day you can see across to Jerusalem. And then down to the Dead Sea – literally – as we drove from Amman at 750m above sea level to the Dead Sea at over 400m below Sea Level, the lowest point on Earth – other than of course Freo’s current position on the AFL ladder 😦 . We called into a resort, stripped down to our bathers and had a quick dip – well a quick half dip really as its strangely impossible to submerge any more than half your body. It was pretty cold out, but the water wasn’t too bad. Obligatory photos taken it was back into warm clothes and a warm lunch. Next day it was time to pick up our hire car – something the guys in the hotel were advising against because a) snow was coming and Amman pretty well shuts down at the merest hint of any snow, and b) they wanted us to keep paying for George. Anyway, we picked up our car and made it out before the snow came. Our first stop in the Car was the impressive gorge at Wadi El Majib. Well it would have been impressive had it been open. It closes in mid-November because of the risk of flash floods so we only got to walk up a bit of the way on a raised broadwalk. We then headed into the hills up to Karak. The drive up was spectacular, and the view of Karak Castle as we turned the corner was pretty impressive. Karak Castle is huge, and it looks pretty impregnable. We flashed our Jordan passes and went inside, where you really begin to realize just how big it is. There are dimly lit tunnels and two huge vaulted rooms – each 60m long and one on top of the other. By far and away the most impressive castle in Jordan. Not so impressive was the accommodation in the town, and with the weather coming in we decided to retreat back down to the hotel strip on the Dead Sea to stay the night. Next morning it was off to Petra. Or so we thought. We had Google Maps taking over a mountain pass and approaching Petra from the West, but as we climbed up through the mountains the snow started. It started to look iffy as we continued to climb, passing a slow moving snow plough. Eventually we gave up and turned back with the local police closing the road as we passed them on the way down. We then had an interesting toilet stop at a local bakery where they took us up their produce lift to the 1st floor where all the bakers were baking. The bakers thought it novel enough for them to take group photos. More lovely people. So then it was onto Plan “B”. Plan “B” was to circle the mountains via the Red Sea town of Aqaba and then head north a short way to Wadi Rum. When we got to Wadi Rum, Plan B fell apart somewhat as most of the Desert Camps were – wait for it – in the desert, which meant you needed to leave your car at the end of the sealed road and catch a four wheel drive out to your accommodation. Moving quickly onto Plan “C”, which we judged to be reasonably foolproof – thank goodness – it was getting late. Plan C was a retreat to Aqaba, where Lawrence drove the Turks back into the Sea, for a comfy hotel. Aqaba is where Lawrence drove the Turkish Army back into the sea. Its Jordan’s only bit of coast, tiny really – about 30kms long, squeezed in between Saudi Arabia and Israel. We picked a hotel in the middle of the City and strolled through the shops at night. We ended up coming back to Aqaba on the way to Israel so this was only a brief hotel stop. Next morning it was off to Wadi Rum, which thank God was reasonably close, given all the to’ing and fro’ing. We had sussed it out this time and had booked a combo four wheel drive trip together with a Desert Camp called the Bedouin Lifestyle Camp. The 4WD tour was great – sitting in the back of a Hilux (all rugged up), visiting various spots in the Desert. If you’ve seen the movie, “The Martian” then you were seeing Wadi Rum. We visited Lawrence’s camp, a cool rock bridge, boarded down a sand dune and walked through a nice gorge. But mainly we just drove around the stunning landscape. We got back to the camp at about 4pm, we didn’t want to hang around for over an hour to watch the sunset from a high dune. The sunset from the camp was pretty good anyway as we huddled around a camp fire, drank Bedouin whisky (sweet tea) and chatted with the Bedouin.The Camp was great –we decided we could live with no hot water for a night, but we wanted an en suite – no getting up in freezing conditions to go to the toilet block in the middle of the night. As it got darker and colder, we moved inside into the communal tent, which had a poorly performing gas heater, together with an open wood fire they lit inside. We had a brief visit outside as it started to snow , to retrieve dinner – chicken and meat buried in a hole with some hot coals – quite delicious. The Bedouin were great to talk to – they do a lot of it out in the desert I suppose. Nice people. Then it was off to bed – sleeping was an interesting affair. Our “tent” was bloody cold – we had 6, yes 6, thick blankets on our bed and it was still cold. But still we managed to sleep in and had to scurry off to Breakfast before riding the 4WD to the bitumen where we had left our car. Then it was off to Petra. We still managed to hit some snow on the pass into Petra, but Dee’s pretty used to driving in snow so all was okay. We checked out a few Hotels and settled on a really nice boutique hotel (complete with a Cave Bar) right next to the Hotel. Our Jordan Pass included three days at Petra, but we didn’t want to burn one of these on a half day so we headed off to Little Petra. There’s a Little Petra and a Big Petra – true story. Little Petra is pretty impressive so long as you haven’t been to big Petra, so we were definitely in the right order. We walked up the gorge admiring the old temples and caves until we got to the end where we climbed up a narrow pile of rocks to a plateau where we found a small shop selling some souvenirs. We ended up sitting down with the Bedouin guy who owned the shop and drank some Tea – as you do. “Camelboy Camel” was a cool dude, and left his shop to take us on a bit of a tour up to the top of the range where the view was spectacular. The next morning we joined Camelboy Camel once again to go to Petra from Little Petra via a 90 minute walk to the Monastery from Little Petra. And what a spectacular walk it was. We started by walking past some prehistoric villages from the Stone Age and made our way up onto a ridge with spectacular views. At one stage we were walking along a pathway on the side of a cliff with a rock overhang just above us. Spectacular. There was a bit of scrambling up steep bits before we made it to the top and there it was. The Monastery is a huge temple, 50m wide by 45m tall carved out of the rock face by the Nabataeans way back in the 1st Century BC. Mind-bogglingly spectacular in its size and majesty – never mind how they had actually managed to carved it all out of the rock face, top down, all those years ago. After snapping millions of photos, followed by a cup of lemon tea, it was time to head down to the rest of Petra. Along the path down, we bumped into Camelboy Cowboy’s mother so yet more tea was consumed. We couldn’t possibly see the whole of Petra in a day so we decided to do the 6th Century Coptic Church and the Royal Tombs and then we headed out along a goat track to one of the Bedouin villages off to the side. We then got lift back to the car and back to Camelboy Camel’s house to meet his lovely Danish wife and his cute baby boy. His wife is very brave, taking on a totally Bedouin lifestyle, so different from her upbringing. We had a nice meal and some tea, before heading back to our Hotel for the night. Next day, it was on with Indiana Jones outfit and off to explore Petra via the more traditional entrance. This involves walking in the main entrance and then after 900m you enter t he amazing Siq, the narrow gorge that leads to Petra. The Siq has water channels cut into its sides as well as ancient Nabatean graffiti. As you walk down the Siq, it gets quite enclosed and a little bit eerie before opening up into this amazing monument, built in the 1st Century BC and known as the Treasury. It’s an absolute WOW moment – right out of Indiana Jones (which it was). The story of the discovery of Petra in modern times is rather interesting as well – a Swiss explorer in 1812, disguised himself as a Muslim scholar and lured by tales of an ancient lost city, talked a guide into taking him there. And now here we were too. Along with the obligatory camel rides and touts selling trinkets and postcards. Continuing down the Outer Siq, we passed ancient burial chambers along the street of facades, until we got to the ancient Roman theatre, which was also impressive. We wandered around Petra visiting its little nooks and crannies and various temples, before heading up to the top and checking out the view and what remains of the Crusader Castle. Then it was down and up again to the Place of Sacrifice, high above Petra at 1000m. You can still see the remains of the altar and the views were magnificent. After yet another sweet tea with some Bedouin, it was off to find the path at the top of Siq looking down on the Treasury. We found a lady and her son, who suggested we pay them to guide us there and then back to the entrance. It was a good suggestion as we would still be out there looking for it if we didn’t tag along with a local Bedouin. The view down to the Treasury was every bit as awe-inspiring as coming through the Siq – hence the new Facebook profile pictures. The walk back to the entrance was also very interesting, taking us up to 23km of walking for the day, not a bad effort and similar to the previous day. But the day was not finished yet. We headed off to Camelboy Camel’s house to pick him up, together with some supplies for an open fire barbeque outside the cave he used to live in before he got married and needed an actual house. His cave was quite comfy as caves go – even had a front door that locked. But still a pretty tough life with no electricity or running water. Next day, we walked into Petra again and visited the few remaining places we hadn’t managed to crawl all over. Petra done, we headed off to check out Shawback Castle, before heading back to Aqaba. Next morning we drove to the Saudi border and back again along the coast – all of 20kms. We checked out the (possibility of ) snorkelling in the Red Sea but it was cold and windy and we couldn’t bring ourselves to do it. The town itself was fairly pleasant with a nice little Marina, but to be fair we knocked it off fairly quickly, with lunch at the Royal Jordanian Yacht Club, walking along the broadwalk to the museum and then checking out the shops (of course). After a full day and two nights there, it was time to drop off the car and taxi it to the Israeli border. We checked into our hotel, picked up our Israeli hire car and checked out Eliat. It was a vibrant seaside resort town, lots of colour and movement and markedly more modern that Jordan. We drove out-of-town a short way to the Egyptian border and then back to a Dive Club/Bar for a snorkel in the Red Sea. Then our friend Erin joined us for drinks. We’d met Erin in Kasterlorizo, where he had sailed his boat from Israel and had kept in contact. We ended up going to Erin’s house and meeting his wife (who is a robotics expert), before going out to a lovely local restaurant. It was really nice of Erin to look after us and great to catch up with a local. Our trip to Israel was winding down and we had a couple more places to go. We left the Red Sea behind us and headed for the Dead Sea. This time the weather was warmer and we had a great float in the sea. We also had a pool and spa in the hotel that was fed from the Dead Sea and it was great to float around in there as well. Just up the road from the Dead Sea was the amazing Masaba, an isolated mountain top fortress, 500m above the Dead Sea. 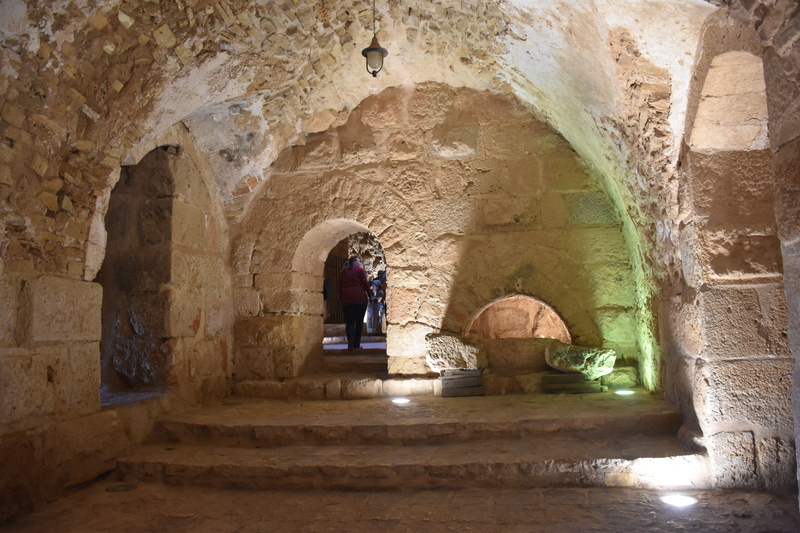 It was originally built around the 2nd Century BC and then King Herod built some luxurious palaces later on. It was the last bastion of the Jewish revolt against the Romans as they held out under seize for 2 years until the Romans finally managed to breach the defenses by building a huge earthen ramp up one side. We passed on the 2 hour walk up the mountain and took the cable car to the top instead. Impressive place. Then it was time to drive back through the Negev Desert to Tel Aviv airport and hop on a plane back to Cyprus. A brilliant trip through history. 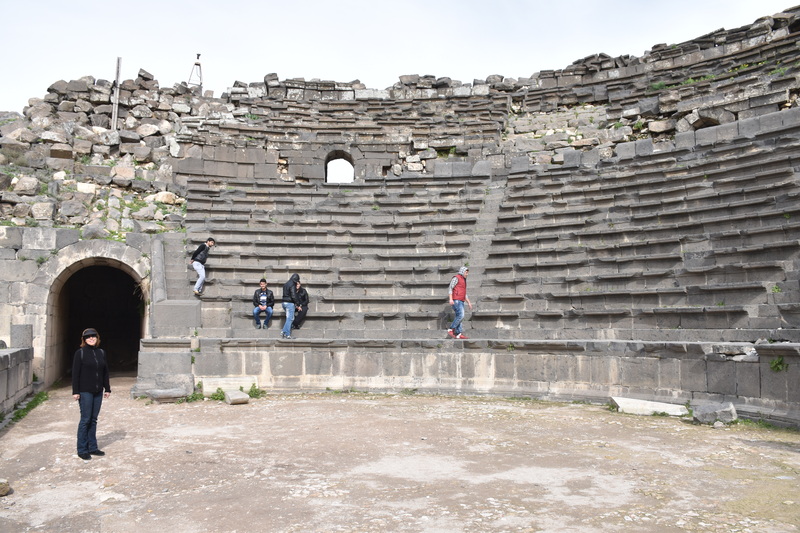 For photos of Um Qais, Ajlun Castle and Jarash click HERE. For photos of Amman click HERE. For photos of Red Sea (Jordan side) click HERE. For photos of Wadi Rum click HERE. For photos of Little Petra click HERE. For photos of Shock Castle click HERE. For photos of Aqaba click HERE. For photos of Eliat click HERE. For photos of Dead Sea (Israel side) click HERE. For photos of Masada click HERE. This entry was posted in Jordan and tagged amman, Aqaba, Dead Sea, jerash, little petra, masaba, petra, red sea, wadi rum by stull61. Bookmark the permalink.